Certain sleep patterns affect our performance. The brain can ignite a 'sleep switch', governed by the number of hours you have been awake. If one is driving a car at the time, three to four seconds is all it takes to drive off the road. Humans need roughly eight hours sleep a night to maintain an alert and healthy state. If they manage with less for several days, they will build up a sleep deficit. If they average four to five hours sleep over four or five days (as many executives do), they will experience the same level of ‘cognitive impairment' as if they'd been awake for 24 hours. The part of the brain responsible for memory consolidation doesn't function well for five to 20 minutes after you awake. One should never make an important decision just after one has woken up. It is dangerous to encourage a ‘macho' company culture, in which employees are expected to put up with sleep deprivation. In the US, drowsy drivers are responsible for a fifth of all motor accidents and 8,000 deaths annually. 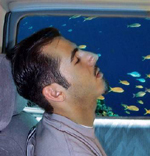 It is estimated that 80,000 drivers fall asleep at the wheel every day. Executives should set ‘corporate sleep policies', imposing limits on how much employees can work. Ideally, it should not be more than 12 hours a day and no more than 16 consecutive hours.